May your kids become a master of control. Teach your kids self respect and confidence by taking them to Kung Fu! Kung Fu is a martial art designed to train the entire body and mind. It originated in China. Kung Fu can develop kids’ self confidence and teamwork and may help prevent bullying at school. Your kid could be the next Bruce Lee! A talented young girl practicing kung fu moves. Is Kung Fu a great activity for your kid(s)? 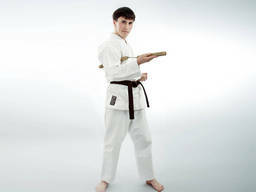 Martial arts kids’ activities like Kung Fu suit most personality types and developmental levels. If your child has additional needs like ADHD which mean they may benefit from increased self control and focus, Kung Fu could be the answer! It is generally recommended that kids start around age 6 when they have developed sufficient muscle strength and control for punching. Get your kid to start learning Kung Fu! Not sure where to find kung Fu lessons for your kids? There are a number of kung Fu schools around which offer tuition for kids and a search on the ActiveActivities directory will locate the closest one to you. There are a few different styles of kung Fu including Wing Chun, Praying Mantis and Hung Gar (associated with the Shao Lin School) which are all equally suitable activities for kids. To take lessons you will probably need to join a martial arts club or academy. A club usually charges around R70 per lesson, and will generally give your child access to a timetable of classes at different times. If Kung Fu isn’t your child’s thing, why not try a different form of martial art such as judo, jiu-jitsu or karate? For those kids who enjoy combat, there are a number of different fighting techniques and some even incorporate weaponry so your child should never get bored! Your child will probably just need a uniform and martial arts shoes to begin with but as they progress you might need to buy padded protective gear and any weaponry they need. If you are considering Kung Fu for your kid, why not give it a try? With training and dedication one day maybe your child could join the masters!